Today we’d like to introduce you to Colleen Bourgeois. Colleen, can you briefly walk us through your story – how you started and how you got to where you are today. How to begin…. there is a happy ending. It starts with me, as a young 32-year-old Mother of 3 small children and a life-threatening realization that many people face today. When we mention the word cancer, it gets everyone’s attention since nobody is exempt from the possibility. I was diagnosed with colon cancer. The news was devastating and life forever changed. Fortunately, with the help of great doctors and modern medicine I would make a full recovery……… but, I would never be the same. Life became better. After a year of chemotherapy and the passing of five years, I was officially cured. This episode of cancer would not return, nor any other reoccurrence to date. Through reading and jumping in on a few yoga classes in my year of recovery, I realized there was a part of me waiting to be born. As fate would have it, I discovered how to save myself and start my career. Yoga literally fell into my lap and the door of opportunity opened wide. Although it appears my cancer was partly due to a genetic predisposition, there were other possible factors which contributed to my disease. I was forced to take a long, hard look at my lifestyle. While I have always eaten well and exercised, the stress level in my life was a contributing factor. The year was 1994 and the western world had not fully opened its doors to the eastern world and philosophy of meditation and yoga. The next chapter begins. At my children’s annual elementary school auction, I happened to bid on a 6-month unlimited yoga package in a particular type of yoga I had wanted to try. After my second class, I was thrilled to find the type of yoga I had yearned for. I immediately decided to take the teacher training a year after my first class in 2001. After teaching for two years, the previous owner of the studio inquired if I had a desire to purchase the studio from him. Life is really great sometimes! 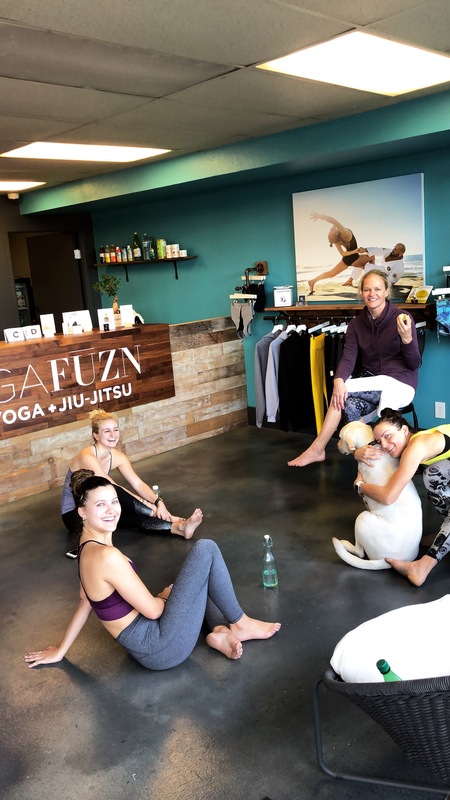 Currently, YogaFUZN (formerly Bikram Yoga La Jolla) is celebrating its 15th year in business. I am very happy to say, I share my yoga living business with my youngest child, my daughter, Genevieve, who was only 11 months old when the story began. The life journey is never smooth, there are bumps to be expected. Being a stay-at-home Mother of three and venturing into the business world had its many struggles with daily learning. Juggling so much and staying focused on what is truly important, I learned to discern my priorities. The lessons continue today as businesses change. I am growing and learning each day, realizing, nothing is easy. It isn’t supposed to be. I have learned to live my life more fully present. Nothing compares to cancer though, so, daily bumps are simply bumps. Move on. 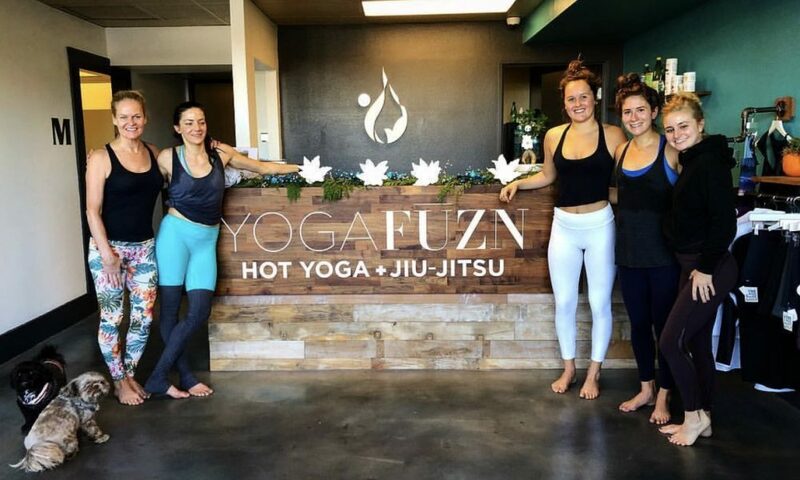 YOGAFUZN La Jolla – what should we know? What do you guys do best? What sets you apart from the competition? 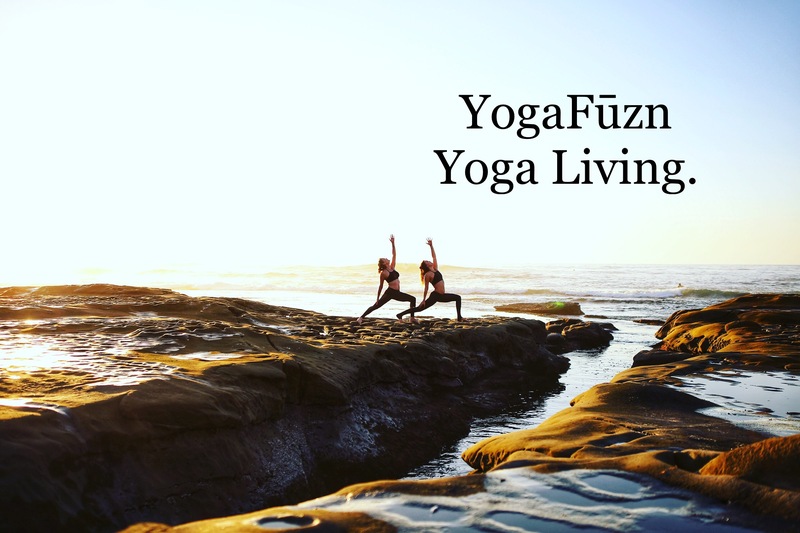 YogaFUZN is a yoga living business. In other words, we are a full-service yoga establishment offering several types of heated and non-heated yoga. We also offer many different items to encourage a healthful approach to your lifestyle. Our items allow a yoga practitioner to simply fulfill the needs of a yoga practice and lifestyle. There are only a few items necessary for yoga, but, those items are very important and should not only support a healthy, daily practice but, be sustainably produced to support our environment. We specialize in having highly certified yoga instructors that interact well with all practitioners, understanding the human elements that are revealed in so many ways through this ancient practice. We are a supportive studio that knows our students and appreciates the community feel. We are known for our Mother/Daughter team. I have been practicing yoga for over 20 years and teaching for 17 years. My daughter Genevieve brings in the new blood and new styles of practice to our studio, while still being certified in the same method as myself. We both attended the same intensive 9-week training course. Our heart and soul is in our career and we are highly visible in our studio. I am most proud of the commitment I made to this practice. It has saved my life in many ways. I am a survivor of many sorts……. partly due to business decisions and actions taken in a highly competitive market. The biggest difference that sets us apart from other studios is our variety of yoga. We not only offer the original, 26 posture and 2 breathing exercise series in a hot room but, our vinyasa classes are some of the best and also most popular. We took the best teachers and provided the best surrounding to support both styles. We are one-stop yoga. The proudest moment was when my daughter followed in my footsteps and completed the same 9 Week Intensive Yoga Training that I took 12 years prior in 2001. She taught her first community class in November of 2013. We became a team and I had never even dreamed of this possibility. Life is amazing.